Ever since I made this edging, I had wanted to make it in different colours (not as Christmas Trees). Then one day, a while ago, Carolyn wrote to me to say she'd used the edging for a hanky with a leaf design and it looked so pretty! You can see her hanky here on her blog and here on Craftsy - such a nice match between the shape of the edging and the leaves on the hanky and the colours - perfect, isn't it? but now I've got this far, I think I'll keep going with the pink, yes? Blue or green would have looked good too! - quite amazing what changing the colour does, isn't it! White - it would also make a beautiful wedding hanky, I have another one to do. Although I'm not a pink girl, I do think you've chosen the perfect color for this hanky! Yes, keep going. One of my dearest treasures is a hanky with a tatted edging (probably in size 100 or smaller) that I received as an anonymous 8th grade graduation gift in the mail. They are such perfect treasures! So pretty! That edging is still on my to-do list. I was thinking of making Christmas table mats with it, but seeing it in a different colour suggests other possibilities. 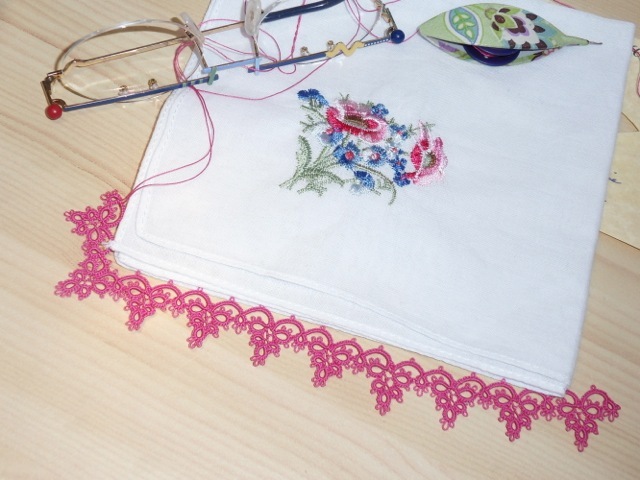 Agree with Fox, pink is perfect for this hanky. So pretty in the pink. Lovely pattern.